The Rhode Island Avenue Metro station will remain closed until Monday morning after debris fell from the station's ceiling twice in 24 hours. 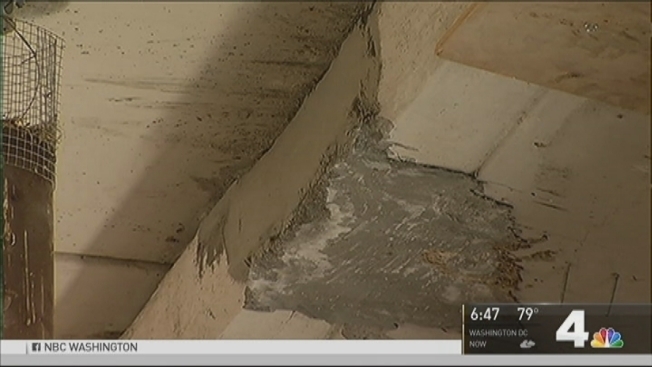 Red Line trains have been bypassing the in Northeast D.C. station since Thursday night, after a small piece of concrete debris fell on the mezzanine. The debris fell about 40 feet from the spot where metal and concrete fell Wednesday night alongside an escalator bank. No one was injured in either case, Metro said. A station manager found the debris both times, said Metro's Chief Operating Officer Joseph Leader on Friday afternoon. Free shuttle buses are running to and from the Brookland station. Metro riders should expect delays in both directions. Trains are passing through the Rhode Island Avenue station more slowly and are not stopping at the station. Leader said the station shut down Wednesday night so crews could assess and repair the damage. It reopened Thursday morning after the station was found to be structurally sound and safe. However, after debris fell a second time, crews performed a more "robust" inspection and called in third-party experts, Leader said. "We are placing safety first," Leader said. "We need to ensure that the structure is sound, and we need to ensure that we eliminate all the hazards for our customers...."
Crews have discovered and removed some more loose concrete, and Metro is planning to bring in special equipment later Friday, once train service ends for the night. Crews will inspect the station's concrete structures, as well as the concrete platforms. They also plan to install a large piece of safety netting. So far, the structure appears to be sound, Leader said. He said a possible culprit for the debris could be some water that got behind the concrete, got into a cycle of freezing and thawing over a period of years, and eventually separated the concrete from the structural membrame, causing the concrete to crack and then fall. "...I know this is a holiday weekend, and I know we are inconveniencing a lot of folks that live [near] and use this station," Leader said. "However, we are doing it for your safety." The station will reopen at 7 a.m. Monday. Although Metrorail normally begins operating at 5 a.m. weekdays, Monday is a holiday, and the system will open two hours later the usual.